I'm officially home, but not officially back from my holiday just yet...just dipping my toe in for a moment and saying hi! 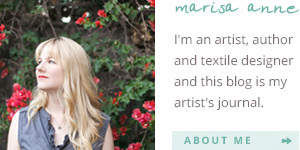 I loved hearing from you on my blog Christmas card. It was so nice to reconnect with you especially those that I had lost touch with over the last few years. Let's just say, I haven't been the best about sending Christmas cards lately (well, probably for the last 4 years....) I used to love sending them. In fact that was the one time of year that I opened up to my creativity and shared it with my family and friends. I used to make my cards by hand (even hand drawing a reindeer on each and every card one year). But over the last 4 Christmases, life has been especially full (exciting and scary) in so many ways ~ one relationship came to an end, another one began, 3 moves, and an extreme amount of focus on building a business that had many attempts to discover its voice, that has finally found it and is now officially on its way! Thank you for your patience and understanding while I took care of "life" for a few years. And to those of you who believed in my dream with me, and gave me hope and direction on days when I lost sight of where I was headed, thank you. I'm happy to report that I'm happy, that I've made it, and I'm on the other side. And I guess this blog has taken the place of my annual cards. It is now the place where I share my creativity, with everyone. It is my annual Christmas card, updated all year long. What I would also like to say is ~ to those of you near and far who have known me for a very long time, especially over the last few years, even though I haven't sent my annual card to connect with you during this season, you all are ALWAYS in my thoughts and this is my card sending you much love, happiness, health, peace (and of course a little creativity) in the final days of this year and on into the next. And to those of you who just know me through this blog, I'm especially grateful to have my circle of friends continue to grow throughout the world. Thank you for coming on the journey with me and for sharing your journey as well. To everyone who is celebrating this holiday today, I'm wishing you a very Merry Christmas. And wherever you may be, I'm hoping you are having a beautiful day. Last minute shopping? 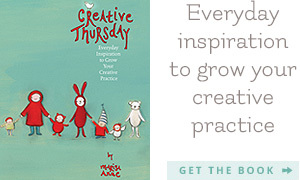 the Creative Thursday gift card!! I'm a little last minute myself with the release of the first ever Creative Thursday gift card, but it just occurred to me (while on vacation) that this might be a fun option for you, so here it is!! And in the new year, I will offer these in traditional gift card form to send by mail as well. They come in prices of $35 or $70, $100 or a denomination of your choice. You can find all the details right here. 4 x 4 in. featuring partidge, penguin, sporting my favorite scarf from the Gap that I wear every day, and Levi the snow owl. Well, I'm off on holiday ~ Yippy!!!!! Can you say "a creative girl needs a much needed break". We're heading up to Ashland, Oregon to be with my Mom for Christmas (can't wait to see you Mom!). I'm sure I'll be checking in here at the blog while I'm away, as Ashland is too inspiring not to share with you. In the meantime I've left you a whole bunch of posts of my favorite things, with eye candy and me gushing over more artists I love. I say, you can't gush enough over what people create and share with the world. Wishing you a happy holiday time, filled with fun, great gifties, visits from Santa Claus and his reindeers, delicious food, a little bubbly, maybe some snow, a good movie or two, treasured visits with those you love, and peace. Kimberly posts her paintings on her blog and she's also started selling notecards and most recently prints!! Meet Sean's sister, Jennifer Hogan. She's a wonderful photographer, and that's all. (just like the name of her shop). Jennifer's traveled all over the world, shooting some of the most compelling images I've seen. The photo above is one of my all time favorites, and one that I thought was perfect to share with you in honor of the season. The following is her description of this special image. "A little boy with pigeons on his shoulders looking like an angel, a cherub. This was taken in the piazza San Marcos in Venice Italy. There on the plaza you can feed the thousands of pigeons who make Venice their home. Here a young boy had just begun to feed the birds when suddenly two pigeons flew onto his shoulders. With delight in his laugh he looked as though he had sprouted wings and become an angel in front of the San Marcos Cathedral. A miracle." It was a big step for Jennifer to open her Etsy store just this past month. So be sure to show her some special Etsy love, something all the artisans and frequenters of Etsy are so good at. And I know I'm not alone in this one. Anthropologie, you gotta love that store! I finally made it back to The Grove (yesterday) here in LA and took some pictures of the Anthropologie store decorations that I was raving about earlier. It's awesome! This store in particular is decorated down to every last detail. Wouldn't it be fun to have that job of decorating Anthropologie stores? I wonder?! Or is it only glamourous from the outside, as many jobs are. But you know it's got to be fun to make those paper mache animals. Can you see the llama among all those paper snowflakes? This is one of the window diplays. I squeezed in a little creativity today in between yoga, trips to the post office and a very fun afternoon lunching and Christmas shopping with Seanie, in the rain. You know I get very excited when it rains here and I can wear my bright yellow boots. I'm known to tuck a little bit of Christmas all over the house. I've been doing this since I was a child. In fact these two are from my childhood. Santa is a little wooden ornament from Germany, and the ceramic tree is a remnant from my miniature collecting days. I have them in the kitchen where I can enjoy them all the time. Just for fun, I listed a couple of hand painted ornaments over at the Etsy shop today. I'm hoping that next year I will plan ahead and make a whole bunch of ornaments!